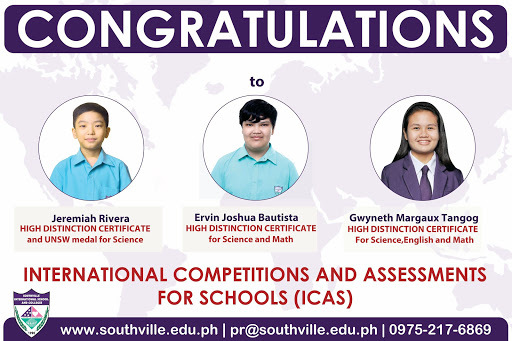 Students from Southville International School and Colleges (SISC) were recognized at the annual International Competitions and Assessments for Schools (ICAS) held November of this year. Gwyneth Margaux Tangog (Grade 9), Ervin Joshua Bautista(Grade 6), and Jeremiah Rivera (Grade 7) respectively received High Distinction Certificates for Science, English, and Mathematics. SISC’s Basic Education Department adheres to its promise of providing excellence in the academic development of its students conforming to the standards of the western curriculum. Monarchs constantly project supreme intelligence in local and international academic competitions, recognizing Southville as a top-ranked international school in the Philippines. Recently, Southville’s Basic Education Department received another full six years of accreditation from the Western Association of Schools and Colleges (WASC), USA. “We are overflowing with joy that our commitment to the delivery of excellence in education is reaffirmed by our accreditors through another six years of accreditation,” shares Ms. Marie Vic Suarez, Principal.